Congratulations to children from the Filton area, pictured at their local library receiving medals and certificates for successfully completing the Summer Reading Challenge 2015. Chair of South Gloucestershire Council, Cllr Erica Williams, was on hand to present the children with their awards. The group represented more than 6,700 children in South Gloucestershire who have taken part in this year’s event at libraries throughout the district. 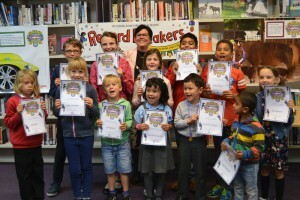 The Reading Agency charity’s annual Summer Reading Challenge encouraged children aged from four to 11-years-old and their families to read six books of their choice during the summer holidays. The challenge is free to enter and took place between 11 July and 12 September. More than 70 volunteers have supported children taking part in the challenge by listening to them talk about their books and helping with the activities in the library. To recognise their contribution, a group of young volunteers from Filton and Bradley Stoke were also awarded certificates at the event.